From 1980 to 1985 Baltimore County, at the request of local historians and community leaders, purchased 142 acres of land in Oella that had formerly been astronomer Benjamin Banneker’s family homestead. On June 9, 1998, the county joined the nonprofit established to develop and support a museum and park on the property, The Friends of Benjamin Banneker Historical Park, to hold a ribbon cutting and dedication ceremony. 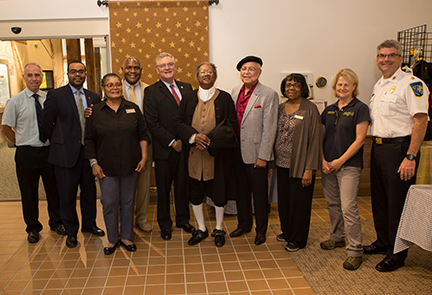 This month, The Friends and the Baltimore County Department of Recreation and Parks held a series of special events to celebrate the museum’s 20 years of sharing the history of the life and times of Banneker. Master griot Bob Smith brought life to the events with his inspiring and dramatic portrayal of Banneker, who is considered the first African-American man of science. Banneker was a mathmetician, astronomer, almanac writer, surveyor, abolition advocate and naturalist during the late 1700s. An anniversary program on June 1 featured remarks by recently appointed County Executive Donald Mohler, music, and the unveiling of a 20th anniversary commemorative plaque. A celebration dinner on June 2 at the Community College of Baltimore County’s planetarium featured University of Maryland Baltimore County President Freeman Hrabowski as the keynote speaker, a showing of “Benjamin Banneker’s Astronomy,” and signing of a commemorative document to be sealed in a time capsule for the next 20 years. On June 3, an appreciation ceremony for places of worship was held. It was from the museum’s site (purchased in 1737 from Banneker’s father Robert Bannaky) near Catonsville that Banneker crafted one of the first all-American-made wooden clocks and wrote his almanacs and famous correspondence with Thomas Jefferson. In 1791, Banneker was assigned to the Pierre L’Enfant team to survey for the new federal city, Washington D.C. The property at 300 Oella Ave. includes a split log colonial cabin furnished with reproduced artifacts, a colonial herb garden, vegetable garden and trails, including the historic Number 9 Trolley Line Trail. For more information on the museum and events, call 410-887-1081 or visit friendsofbenjaminbanneker.com.